Under the Standards Alliance program, work has been carried out by Ms. Diane Thompson, Principal Standards Advisor, to develop action plans to improve the effectiveness of the Enquiry Points and Notification Authorities required under the World Trade Organization (WTO) Agreement on Technical Barriers to Trade (TBT Agreement). The following East African Community (EAC) countries are participating in the Standards Alliance program: Burundi, Kenya, Rwanda, Tanzania, and Uganda. 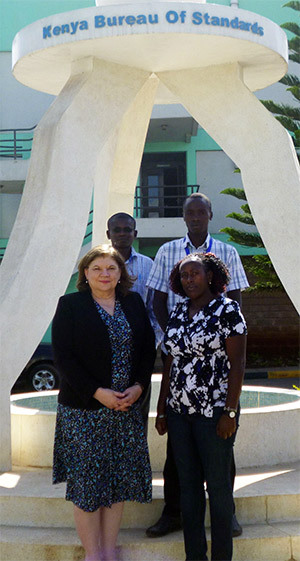 During March, 2016 Ms. Thompson traveled to Kenya to implement the action plan, meeting with staff of the Kenya Bureau of Standards (KEBS) to discuss the three tasks of the action plan: improving the WTO TBT Enquiry Point and Notification Authority, communication with stakeholders, and promotion. The visit included a discussion and demonstration of Notify Kenya TBT, an electronic notification system launched in July 2014 by KEBS. The system was developed with assistance from the United States Agency for International Development (USAID) East Africa Trade Hub and support of the Standards Alliance. On-site training requested by the participants during Ms. Thompson’s visit focused on implementation of the TBT Agreement, resources, TBT notifications, enquiries, electronic notification systems, capacity building, responsibilities of the Enquiry Point, record-keeping, reporting, and management awareness. This website is made possible by the generous support of the American people through the United States Agency for International Development (USAID). The content are the responsibility of the American National Standards Institute (ANSI) and do not necessary reflect the views of USAID or the United States Government.